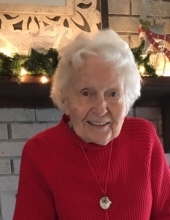 Adeline Belle Maxedon Kimery of Mattoon, Illinois, peacefully departed this world to go to her heavenly home on March 14, 2019. Funeral Services honoring her life will begin at 2:00 p.m. on Sunday, March 17, 2019 at Schilling Funeral Home with Pastor Steve Hayes officiating. Burial will follow at Resthaven Memorial Gardens. Visitation for family and friends will be held from 12:00 p.m. until the time of the service on Sunday at the funeral home. Known for her red hair, Adeline caught the eye of Harold L. Kimery when she was but 14 years old. They married on 5/21/1939. Harold passed away in1998. Mr. and Mrs Kimery were blessed with 5 children and 3 nieces, 9 grandchildren and 18 great grandchildren. Children: Stephen L Kimery, Linda Lee Kimery Storm, Joel Cleve Kimery (Verita), Paula Kimery, and Becky Kimery Coduto, (Angelo). Nieces: Lorice Kimery, Lorraine Kimery Ciardini, and Bonnie Kimery Lane (Bill). Adeline was preceded in death by Linda, Lorraine and Lorice. Grandchildren: Derek Storm, Joel Storm, John Kimery, Scott Kimery, Stephen Bushur, Heather Bushur Lindamood, Brian Coduto, Megan Coduto, and Jacob Kimery. Adeline was preceded in death by John Kimery, her grandson. Adeline was a member of the First Christian Church of Mattoon and also the First General Baptist Church. Adeline’s ministries included teaching Sunday school, vacation Bible school, served on the Board of the Salvation Army and many other endeavors. Memorial donations in her honor may be given to the First Christian Church of Mattoon or the Salvation Army. To send flowers or a remembrance gift to the family of Adeline Kimery, please visit our Tribute Store. "Email Address" would like to share the life celebration of Adeline Kimery. Click on the "link" to go to share a favorite memory or leave a condolence message for the family.